Though many of us took time off over the holiday weekend, the weather certainly did not. A series of storm systems affected large areas of the country with strong tornadoes, hail, flooding rainfall, and/or blizzard conditions from the 23rd through today, and will continue through mid-week. The first event of note was a severe weather outbreak on the 23rd over the Mississippi and Ohio valleys. There were 51 preliminary tornado reports from several states (the final number of confirmed tornadoes will likely be different) and over 250 reports of wind damage. This included the first documented December tornado in Michigan (an EF-1 near Canton). The hardest-hit areas were northern Mississippi and southern Tennessee, with a single thunderstorm producing nearly continuous tornado damage for over 2 hours and approximately 140 miles through several communities in northern Mississippi into Tennessee, including Holly Springs. Preliminary survey information indicates two separate tornadoes with a short gap in the damage path, the first rated EF-3 and the second EF-4. Several other strong tornadoes occurred across Arkansas, Tennessee, and Alabama, with a total of 7 being rated EF-2 or higher (subject to change as further damage surveys are completed). Below is an image of WDT’s radar-based rotation track product over some areas most affected by the outbreak. The strongest wind shear is shown in red, with decreasing strength in yellow and green. Preliminary tornado reports are shown as black triangles. The paths of the strongly-rotating thunderstorms responsible for the tornadoes appear as long parallel swaths. WDT’s Rotation Track product for the 24 hours ending at 6 am CST on Dec 24, 2015. Additional severe weather occurred across the South on Christmas Eve and Christmas Day, with a few reports of tornadoes, wind damage and hail (some up to baseball size). On the evening of the 26th, more intense tornadoes occurred, this time in the Dallas metro area. Damage in Garland, TX was preliminarily rated as EF-4. Even though much of the extreme weather this week looked more like spring than winter, the storm also had a wintry side, with eastern New Mexico and western Texas receiving a major blizzard from the 26th through early on the 28th. Snow amounts exceeded a foot in some places. 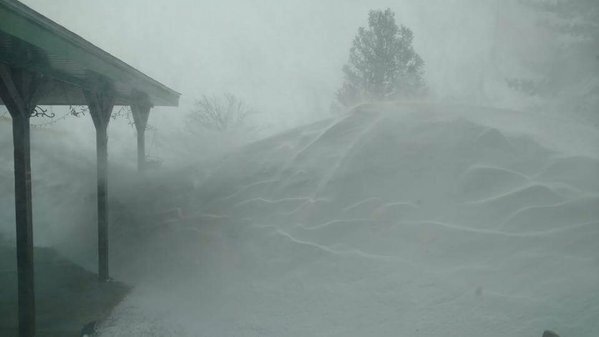 Persistent strong northerly winds frequently gusting above 50 mph piled the snow into drifts of 5-10 feet and closed numerous roads. Snow drifts in Friona, TX. Another facet of this storm system is very heavy rain and flooding. Many areas from east Texas to southern Illinois and parts of Mississippi and Alabama have been inundated with over 6” of rain between 6 am Christmas Day and 6 am on the 29th. Some locations received over 10”, which is a tremendous amount of rain for this time of year. The widespread heavy rain has led to significant, in some cases record, flooding on many rivers. 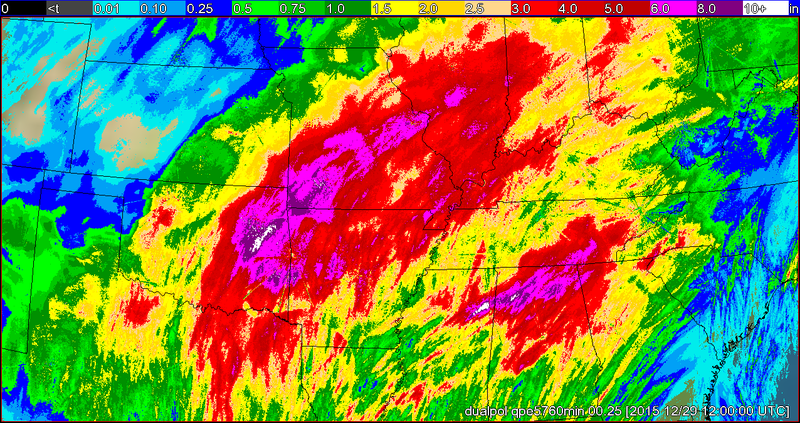 WDT’s radar-estimated precipitation for the the 96 hours ending at 6 am CST on Dec. 29, 2015. USGS flood gauges showing many locations with major flooding in progress on the morning of Dec 29, 2015. 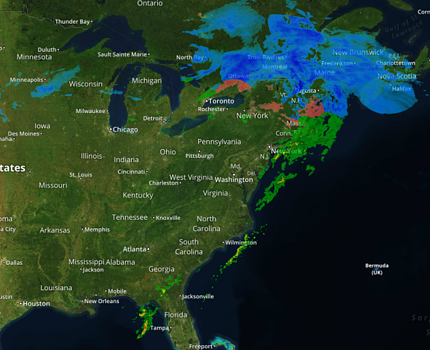 As this storm moves east, it is still producing heavy rain, ice, and snow across New England. Upper New York is expected to receive freezing rain and sleet that will transition into rain later tonight. A Winter Storm Warning is currently in effect for most Maine, where the forecast calls for snow, mixing with sleet. The worst of the storm will move off the coast on Tuesday night. 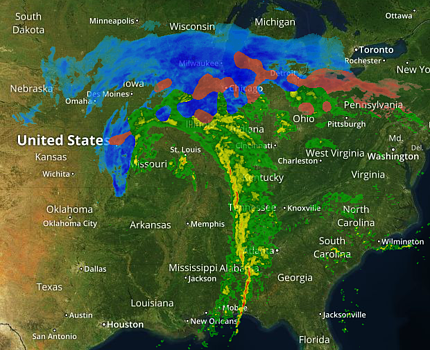 Yet, even as this storm system leaves, damage will continue. Since water moves downhill, you can expect significant flooding to affect the Deep South in the coming days.